Forget Hogwarts, Witchcraft Academy is the new school for learning magic. Using 5 reels, 4 rows and 20 fixed paylines, the Halloween themed slot is NetEnt’s spellbinding craft of 2018. Highlights of this review include the Elements Bonus and a Free Spins Round with 5, 10, 15 and 20 free spins. 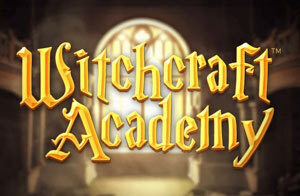 The Witchcraft Academy Slot is playable from 20p a spin and available on mobile, tablet and desktop devices. There’s a number of reasons to play new Halloween slots. They’re creepy, atmospheric and incredibly eerie. Today, slot games released during the spooky season are some of the best slots available. Witchcraft Academy by NetEnt is no exception. In this Witchcraft Academy slot review I’ll tell you what it’s all about, how much you can win and how much to play. We’ll also look at the slots features and break down the pay table. So then, time for school! NetEnt Witchcraft Academy is a Halloween slot based on the gambling world’s school of wizardry and witchcraft. The game has 5 reels, 4 rows and 20 pay lines with coin values adjusting spins between 20p and £200. Set in a haunted library of mysterious spells, ghosts and magic, players follow students Earthora and Efora in their quest for riches. In terms of graphics and gameplay, Witchcraft Academy is one of the top 5 slots to play this Halloween. It’s charming, full of goosebumps and very eerie. The sound effects in the slot work incredibly well as does the backdrop of ghosts, flying brooms and moving books. While not as spooky as Lightning Horseman or Wolf Hunters, Witchcraft Academy is strangely curious. In a clever design effort from NetEnt, the slot begins with players in a haunted library, onwards to a dungeon and ultimately to a deep cavern for the slots biggest riches. It’s a spooky and rather compelling way to build the features into this game and it works rather well. The NetEnt Witchcraft Academy Slot uses wilds, scatters, elements bonus (pick and win) and a free spins round to enhance the games payout capacity. In the Elements Bonus players can access the next level (free spins round) and play for up to 20 free spins, this is one of the best Halloween slots features we’ve seen in 2018, a bonus within a feature. At 96.38% payout rate RTP, the game joins higher accolades of payout for Halloween slots while a jackpot of 400 coins is relatively modest. However, a top payout of 160,000 coins is highly competitive if not simply magical. 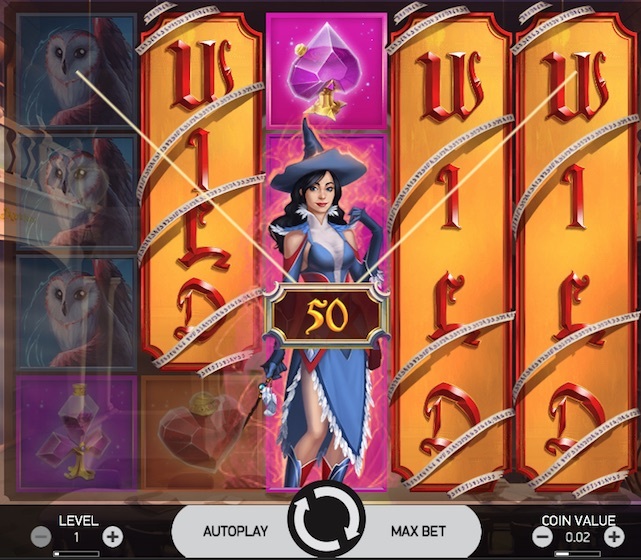 Mobile slots players are not left out either, HTML-5 and NetEnt Touch technology put the Witchcraft Academy mobile slot in reach of all smartphones and tablets. Although we conducted this review on a desktop device, the mobile variant is equivalent if not better with its touch controls. With a badge that’s reminiscent of a Hogwarts faculty, the Witchcraft Academy Stacked Wild is the slots payout maker with the usual Wild rules, however, they’re stacked. You can find them on reels 1, 2, 4 and 5 in the main game and also in the free spins bonus. Like the other symbols in the game, the Witchcraft Wild can appear 4 symbols high making it very worthwhile. Just look at the image above: Stacked Wild Symbols can create mega wins when forming up with Efora the Witch or her Wizard boyfriend Earthan. In the screenshot above, the 40p bet returns a £14.70 win. The Elements Bonus is worth 20p of anyone’s money and a real testament to NetEnt’s design studio. This is very cool and unlike anything we’ve seen before. It’s a pick to win bonus with Witch Efora and Wizard Earthan using their spells in an attempt to unlock the free spins game. And that’s just it, you access the free spins bonus from within the Elements Bonus, a multi-level reward! You can trigger the Elements Bonus by landing 3 or more scatter symbols (bonus) anywhere on the game’s reels. Again for some reason, I’m thinking about Harry Potter, but it looks a lot like wizard chess! Check out the screenshot at the top of this review. At this point the Elements Bonus gets a bit frightening, the music goes all sinister and things turn violent. 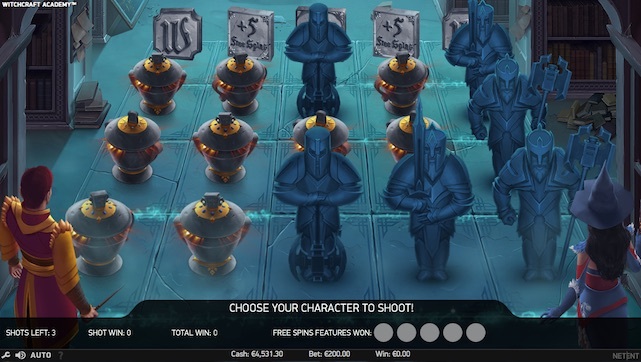 Choose Efora or Earthan who will now cast spell shots against random columns revealing prizes, or unlocking the free spins if they can hit scatter symbols. What I like about this bonus is the animation, dark atmosphere and explosive rewards when the armoured guards explode. This I’m sure will become a top Halloween slot game with a bonus such as Elements. Ok, firstly, this is no ordinary free spins bonus. Witchcraft Academy is a Halloween slots game with more punch than your average spooky spinner (10 free spins). You start with 5 free spins in this game but can win additional spins ranging from 5 to 20. 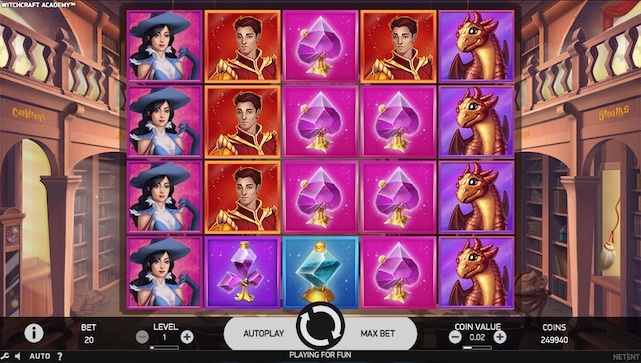 Plus, there’s an added benefit that everything you win here is added to anything won in the previous Elements Bonus (Remember, you activate free spins from within the Elements Bonus). 3 or more Scatter Symbols collected during the Elements Game will activate 5 free spins with the unlocked free spins features. Get additional bonus spin and you’ll win more free spins. This really is the ultimate reward of the game, but I’ll warn you now, it’s a high variant slot and you’ll pay to see it. Unless of course you get lucky or use some magic that you learned at the Academy. How much can you win playing NetEnt Witchcraft Academy? No new online slots review is complete without the ultimate question. How much can you win? The Witchcraft Academy Slot offers a fairly wide betting scope with spins from 20p to £200, so we’ll look at the pay table for these bet values, the lowest and highest spins. At 20p play using a coin value of £0.01, you could win £0.05 for 3 card symbols, £0.80 for 5 x owls or £2.00 for 5 of a kind Efora symbols (She’s the witch). Earthan the Wizard creates the highest payout at 400 coins and also the slots jackpot, that would be £4.00 at this level. However, the game is 20 pay lines strong so there’s lots of concurrent winning activity going on! The Witchcraft Academy top payout of 160,000 coins at 20p a spin is £1600. Let’s say we’re high rolling at £200 a spin (£1.00 coin value). You can now win £5.00 for 3 x card symbols (slots lowest prize), £100 for 5 x dragons or £200 for 5 x Efora symbols. The game’s jackpot is just £400, only twice the betting cost. But if you’re playing at this level, you’re again relying on the big wins from the stacked wilds and the Elements Bonus. But be cautious, it will cost a lot in bets if you’re chasing the Free Spins Game! At £200 a spin the highest payout of 160,000 coins is £160,000. The Witchcraft Academy Slot from NetEnt is a mysterious, spooky and at times sinister slots game that joins the Halloween genre in a good finish. At 20p a spin there’s no denying the attraction, especially with a multi-level pick and win bonus that can lead to multiple free spins. On the downside, it’s unlikely you’ll see those spins without betting a great deal first. But keep the spins low and it could be worth visiting the library with Efora and Earthan in search of the Elements! Well designed, magical, mobile-responsive and rewarding, Witchcraft Academy is a Halloween slot that charms with its visuals and enchants with its gameplay. 90% review score.